When looking for a SIP and media stack I've spotted libre/librem/baresip from creytiv.com. It has I believe pretty unique combination of simplicity, completeness and most of all permissive BSD-style license allowing commercial and closed-source derivatives. Note: page is organized in chronological way. This specification refers to latest version. 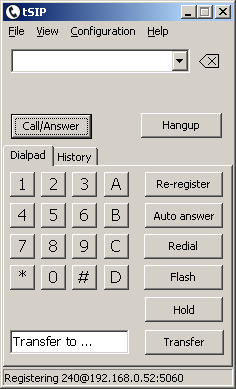 Minimal subset (no video support, no codecs besides G.711, just the essentials for voice calls) of libre/librem/baresip as a console application built with Turbo C++ 2006 Explorer. If you're not a Borland products user stay with original source code that can be used with i.e. VC++ 2003. 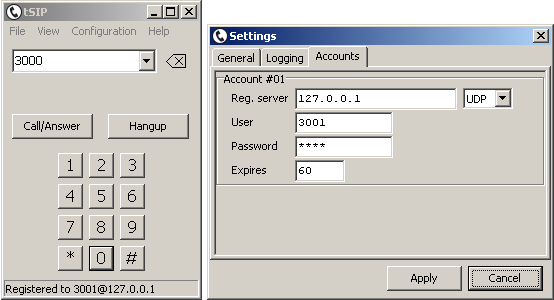 SIP client with graphical user interface built upon re/rem/baresip stack. Feature set is very limited, but whole project is self-contained and easy to compile - no external dependencies. GUI is using simplest possible model: single registration account and single call at a time, but application is portable and using configuration from a local JSON file, so many instances can be run simultaneously with different configurations. Each instance takes ~3 MB of disk space (including wave files with signals such as ringing). ignoring incorrect stale=FALSE (treating always as stale=TRUE) parameter put by some other device with SIP/401 message that was causing periodical loss of registration; hopefully this would be only temporary change. 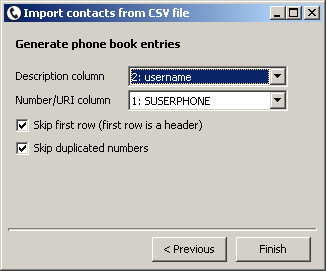 removed unnecessary parts from displayed call URI. 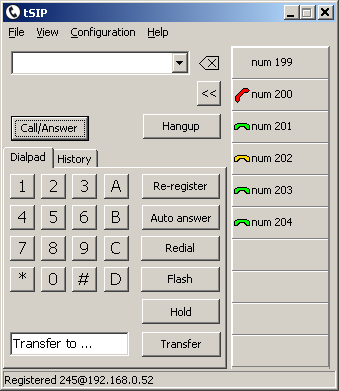 ua_find(): trying to match incoming requests using AOR if matching by Contact fails; matching by Contact only may cause interoperability problems (see Nokia: Problems with incoming VoIP 3.x calls). GUI: fixed problem with temporary freezing when opening log window after long work time. added codec set configuration (enable/disable particular codecs). added local address setting - equivalent of baresip "sip_listen", may be required when using on machines with more than one network interface to specify interface to bind to. making call: assumed that if sip: prefix is present uri domain does not have to be added (previously: unable to call i.e. sip:192.168.1.11 uri, call function was assuming that domain was not present if "@" in uri was not present). 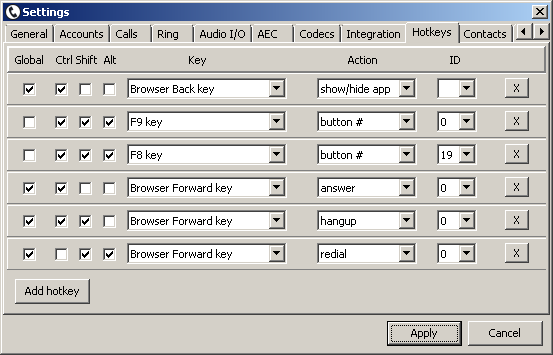 added Speed Dial / BLF panel (application/dialog-info+xml subscription). Added Accept header to SUBSCRIBE message. Although it shouldn't be required (see RFC6665, 3.1.3), Asterisk 11.9.0 is dropping these type of message with error: WARNING: chan_sip.c:27847 handle_request_subscribe: SUBSCRIBE failure: no Accept header: pvt: stateid: -1, laststate: 0, dialogver: 0, subscribecont: '', subscribeuri: ''. Thanks to Barry Mercer for reporting. fixed audio problem with WaveIn audio input (waveInUnprepareHeader() misorder). Earlier versions have acoustic echo canceller (AEC) in a form of Speex AEC disabled due to unsatisfactory results achieved with it. Implementation in this version using WebRTC seems to work much better. In my tests most stable results were achieved when combining WebRTC AEC with WaveIn/WaveOut audio and results varied between computers (perhaps manual delay parameter tuning may be needed) with PortAudio/DirectSound. Note: this is local echo canceller - it eliminates echo introduced by local speakerphone-microphone audio path (and heard by our caller), not echo that may be heard from second party. separate audio module selection for audio source, output and output for ringing. 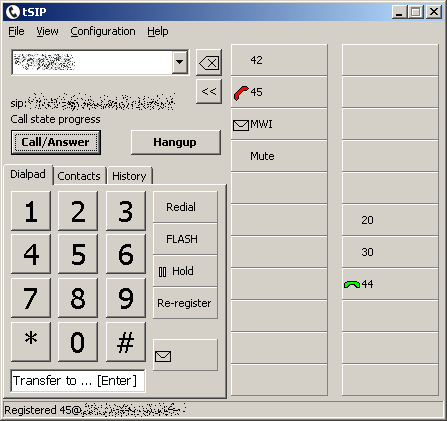 added CALL_EVENT_TRYING, UA_EVENT_CALL_TRYING (info on receiving SIP/100). simple tray notifier window, related settings added. settings: delay for the auto answer, randomized (for fuzzing purposes) from specified range. setting: double width for speed dial. version info: added file description (presented e.g. in Process Explorer and some firewalls). Each time both play and pause commands are sent to handle both cases when SMplayer is playing or is not playing at the moment (pause command itself works as play/pause switch). Command to execute is specified with JSON .cfg file, using JSON editor might help with proper escaping for complex command lines. 2015.05.10 RingPCSpeaker.7z: mini-plugin: ringing using PC speaker (with WinAPI Beep() - does not work as expected with 64-bit windows version as it is routed to default sound device instead of activating physical PC speaker as with 32-bit windows). FIXED: if programmable button with type = Disabled was clicked there was log line: "Unhandled BTN type = some_big_number"
new setting: "History"/"Do not store history to file"
2017.01.29 CommState plugin - using cheap USB-UART converter as physical interface (GPIO: 2 outputs, 4 inputs available) for softphone. new settings: "Show main form when answering call" and "Hide tray notifier when answering call"
Side note: last "big" Windows 10 update, version 1803 had blocked microphone access without any warning. Apparently "Privacy" / application access to microphone had to be modified. added command line option to specify settings/profile directory; allows sharing single exe by multiple instances or multiple users; example: tSIP.exe /profiledir="E:\zrzut\aa bb"
added BLF settings: "Keep previous remote identity info if remote identity is missing in notification" and "Ignore or clear remote identity if call state is set to terminated"